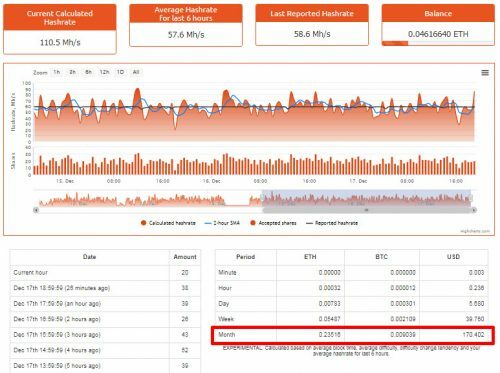 Our Monero/XMR mining rig is already paying for itself and heating our home, but I wanted to see if we could push this further and actually make a more noticeable profit. So I bought 2 Powercolor “Red Devil” RX 580s and rebuilt the crypto-radiator into a bigger case I had lying around (since they wouldn’t fit properly into the compact case I’d been using so far). The whole thing is powered by an “85+ (bronze)” rated 650w PSU. 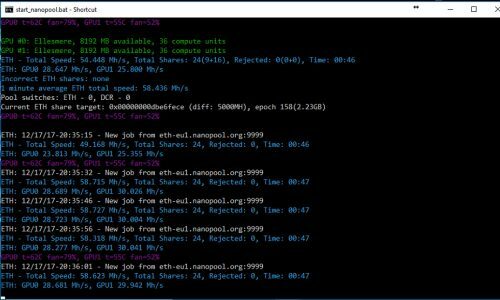 The 8gb RX 580s seem particularly well suited to mining Ethereum/ETH and out of the box we were getting a rate of around 20-22MH/s on win7 x64. Under linux it was closer to 20MH/s, but with the blockchain optimised driver under win 10 that improved slightly to ~25MH/s, though with both cards it was clocking in at nearly 500w..ouch! 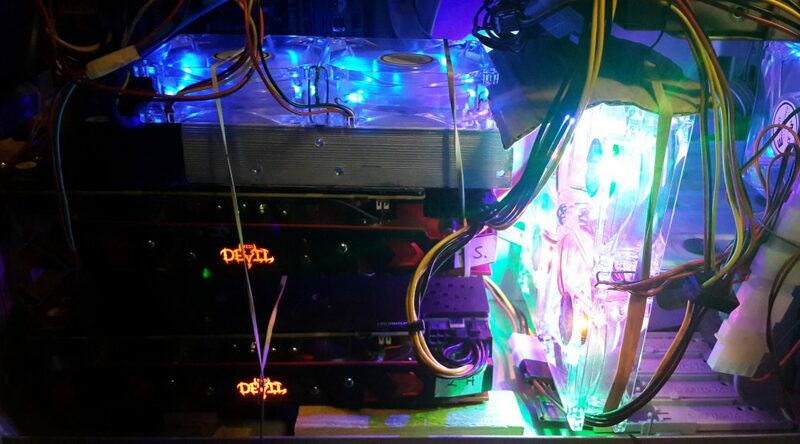 One of my friends (who inspired this upgrade) has a win10 mining rig which gets 30MH per card and reduced power consumption by using a bios mod. I tried the bios mod and whilst it improved the hashrate slightly under linux it was still topping out at about 21MH/s. On win7 that figure also didn’t really change…boo! It turns out that you need to use win10 with the blockchain optimised driver to get the full benefit of the bios mods, and much as I resent having to use windows, once I’d got the rig running on win10 and sorted to cooling out we’ve been getting a steady 29-30MH/s per card. The cooling thing is interesting – most multi-gpu rigs you see online tend to be open “frame”-type constructions but my 580s are built into a full tower case since it’s supposed to be a relatively discreet “raidator” type setup and lives in what is quite a hostile environment (for computers) with a predatory rabbit who loves to chew cables and spread hay around not far away. The lower card was getting the full 30mh/s but the one above it was lagging around 22-24MH/s. One of the cards has Hynix ram and the other has Samsung and the Hynix seems to perform a little better but that didn’t explain the hashrate dropoff. Eventually i tracked it down to be temperature related. 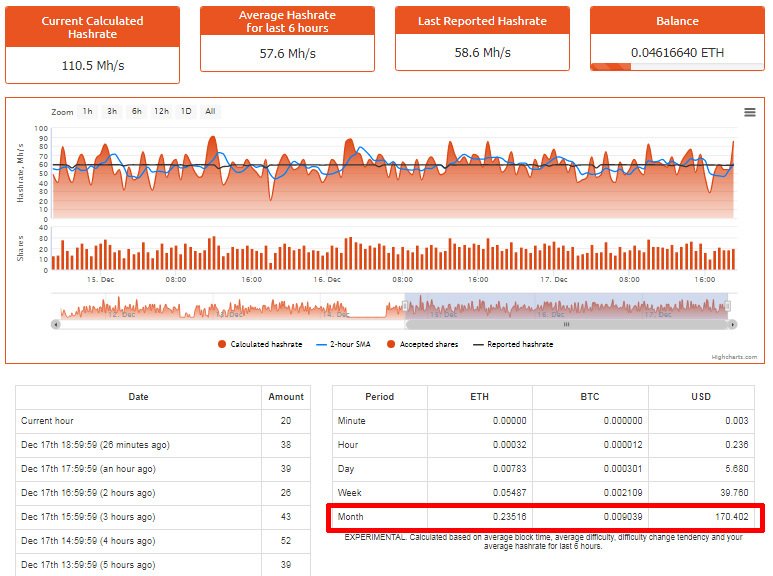 As soon as the card gets over 60 degrees C the hashrate drops off noticeably. The upper card seemed to pick up some of the heat from the lower card so generally runs hotter, and that was causing the hashrate drop. 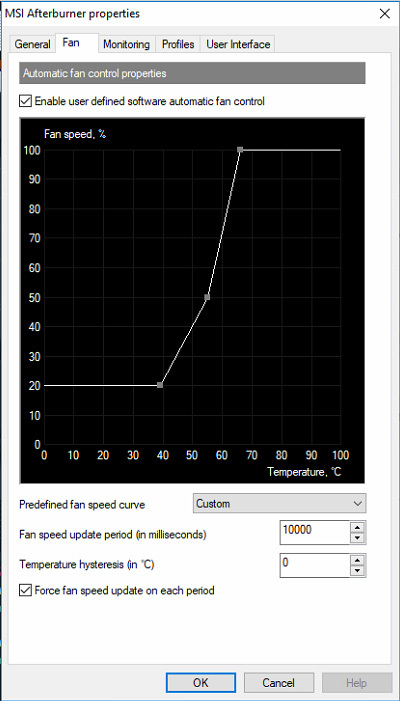 Adding a whole bunch of fans and a heatsink to the backplate of the upper 580 seemed to do the trick though, and along with MSI Afterburner and a custom temperature/fan-speed gradient, now both cards seem to be steady at 30MH/s and have been for a few days now. 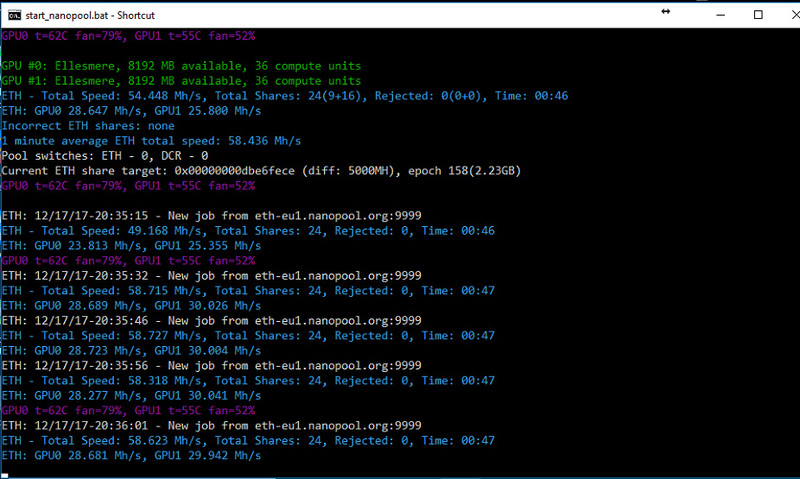 I’m using Claymore’s dual miner which does seem to hang occasionally but I wrote a little VB script (run every 5 mins by task scheduler) to give it a nudge now and then and so far so good – it’s been running steady at 30/30MH/s for a few days now and the ETH is coming in quite predictably and it definitely seems to be profitable. 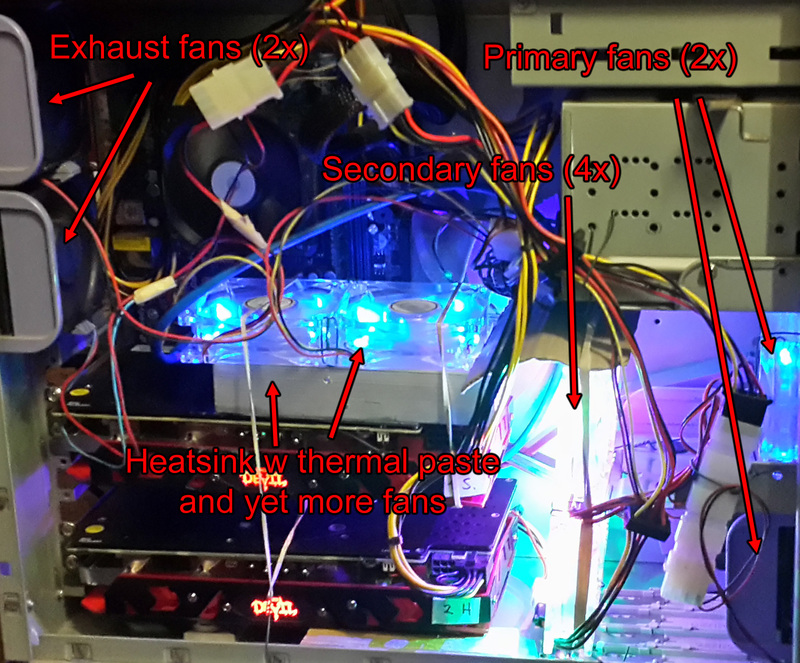 The bios mods also seemed to reduce the electricity consumption noticeably and now the whole rig with a total of 10 fans comes in at around 400w – much more palatable. From a security point of view it’s a bit of a nightmare though – compared to the previous linux build which literally just got built and ran flawlessly for months on end, this ETH rig seems a bit more “rickety”. The script which keeps claymore alive doesn’t work if the machine gets locked, and claymore only starts when the machine logs in, so basically to fully automate the process requires the win10 install to auto log in, and then remain unlocked as well as automatically executing VB scripts every few mins, which is far from ideal from a security pov but whatever, it does seem to work. As you can see from the highlighted bit, at current rates it should produce about $170/mo (£127) and at 400w, and 12.5p/Kwh electricity costs should be around £36/mo, which leaves £91/mo profit (as well as free heating). Not bad, and definitely an improvement over Crypto-radiator version 1! The heat output is noticeably more than the previous incarnation, but so is the noise. 10 fans plus the fans on the card (particularly the on card fans!) make quite a lot more noise than the pair of 750s in the previous crypto-radiator, but the improved heat output means I could move them slightly further away from people (and bunnies) who the noise might annoy. On the previous version I had fitted a duct over the PSU fan exit which reduced the noise considerably, so I might see if I can build some sort of enclosure for the whole of the rear of this machine and achieve a similar noise reduction without impeding airflow. The 2x Nvidia GTX 750ti cards are far from redundant, and given they’ve proved their worth they have been moved to another of our 24/7 servers, which means that server should now cost nothing to run (electricity-wise anyway). Flashing the bios of your card is not without risk. If you mess it up you may well brick your card and will certainly invalidate your warranty. Proceed carefully!